To order books or other items, please call 1-800-GO-BIBLE (1-800-462-4253) or email info@conservative.edu. We will promptly return your call to accept your payment and shipping instructions. Author: Austin B Tucker Publisher: Kregel Year: 2004 Description: Written by a thirty.. Author: Robert K Bower Publisher: Eerdmans Publishing Year: 1964 Description: "This b..
Editor: Bruce Powers Publisher: Broadman & Holman Year: 1996 Description: Revised.. Editors: Robert Clark, Lin Johnson, Allyn Sloat Publisher: Moody Press Year: 1991 Desc.. Author: H Wayne House Publisher: Kregel Publications. Year: 1999 Description: What Ch.. Author: Lawrence Richards & Gary Bredfeldt Publisher: Moody Year: 1998 Description.. 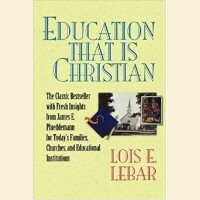 Author: Lois Lebar Publisher: Chariot Victor Cook Year: 1995 Description: Is there a ..
General editor: Michael J Anthony Publisher: Baker Book House Co. Year: 2001 Descripti.. Author: Norman De Jong Publisher: P & R Publishing Co. Year: 2001 Description: A .. Author: Dr Howard Hendricks Publisher: Multnomah Year: 1987 Description: Seven proven.. Author: Frederic Bastiat Publisher: Foundation for Economic Education Year: 2007 Descrip..